Zeebox, the social TV app, is working with hardware manufacturers to integrate its technology into TV devices before the end of this year. Speaking today at the Social Media World Forum in London, Simon Miller, chief technical officer at Zeebox, told the audience of 50, that the integration would mean its interface would, for the first time, become "overlaid on the first screen", which would be a "wild west". 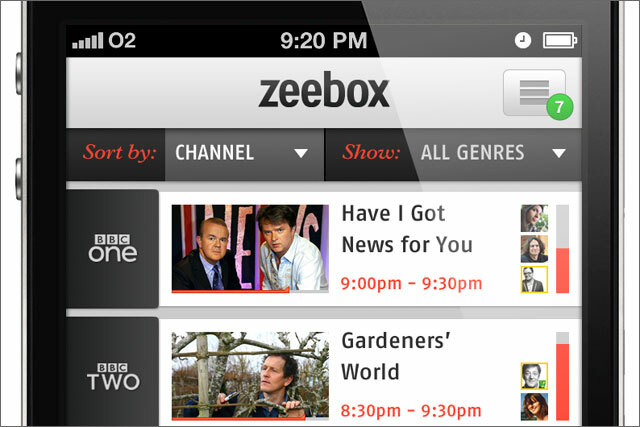 He also revealed that Zeebox's Android app would launch in the next two weeks. Miller was part of a keynote panel at the event that discussed the state of social TV and the trends which are driving it. Lloyd Salmon, co-founder and director of Outside Line, said that while second-screen devices were proliferating, what was core to social TV was understanding consumer behaviour. He said the "narcissistic five minutes of fame" drove social TV because "people want their opinion heard". He said agencies and brands should think about audience behaviour first, "then create content ideas around that ... underpinning that is hardware tech but it's the adoption of that technology that will be really driving [social TV]". Miller argued that not all TV viewers actually wanted a social TV experience. He discussed results from interviews Zeebox did, prior to its launch, with 6,000 people about their TV viewing habits. It found that half of them did not want a social experience when watching TV, because for them it was a private experience. Miller said: "This doesn't mean it won't get social. But any proposition which pins itself on being social is not going to work. "Zeebox doesn't rely on you being social – you don't need to sign in with Facebook or Twitter"
He said that its research found that the most important thing for TV users was finding out more information, and the second, "which was the most surprising and interesting", was that they wanted to buy what they saw on TV. Zeebox added a click-to-buy function last month. Sidharth Jayant, content service manager at Samsung Electronics, said that in social TV, the aim should be to "focus on the TV and then make it social" and not the other way around. He said: "There is a lot of focus on the second and third screen, but that has to be in relation to what is being watched on TV, otherwise there will be a usage lower than what you expect." David Nahmani, director of business development and partnerships at Orange / France Telecom, said social TV activity generated "a lot of data". He said: "Tomorrow's value will come from understanding data from an advertising and broadcasting perspective. "When we combine the strength of apps with the carrier it becomes really interesting from a monetisation standpoint."